Hey jerks! Stop acting like the subway is your bathroom! Or your living room! Because it ain't, alright! 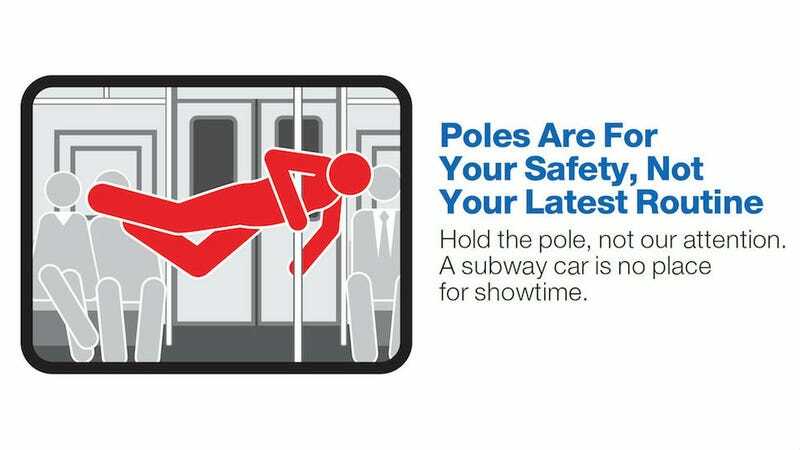 This is essentially the latest push for New York City subway ads and some of them are astounding. No nail clipping? On a train? Who does that? Someone, apparently, because the MTA is introducing a new campaign called "Courtesy Counts," according to New York magazine, to scold its riders. What began shaming man spreaders and funky subway diners blossomed into ladies combing their hair, "people" cutting their nails (Kate says she's been subjected to this) and pole dancers practicing during rush hour. No music! Cool, cool but here's the thing. Life is crazy and mornings in the city can be madness. If we're honest the subway is an extended bathroom or living room for all of us New Yorkers. It's where we read, catch up on new albums, gossip and sometimes put on makeup if you couldn't get to it before you left your apartment. I mean, I've got lipstick and mascara in my purse right now because I often beat my face between subway stops. But maybe, you know, we should all just promise not to get aggressive with it because while putting on mascara bothers no one, it can turn into "train traffic ahead" when your nail clippings fly into someone else's eyes and they punch you in the face.